The following newspaper reports relate to the Abbott Government ignoring information and advice from stakeholders (see http://a4.org.au/a4/node/742 and http://a4.org.au/a4/node/779). The Government is intent on rerunning policy that has already failed repeatedly. Please note Samantha Maiden and the Sunday Telegraph disgustingly branded people with disability explicitly on their front page as bludgers without any evidence to this effect. PEOPLE with disabilities will be placed on temporary welfare payments unless they can prove they are incapable of working. In a major overhaul of the Disability Support Pension scheme, those under 40 will also be forced to undertake stricter and more regular medical checks. The changes come as the number of DSP recipients is expected to exceed one million people — and the cost to taxpayers balloons to more than $15 billion annually. AUSTRALIA’S Disability Support Pension scheme faces a major overhaul, with the federal government considering temporary payments for some new clients and those aged under 40 to be subjected to more regular reviews. Nearly one in 20 Australians of working age is on the disability pension, which offers up to $800-a-fortnight without a requirement to look for work. 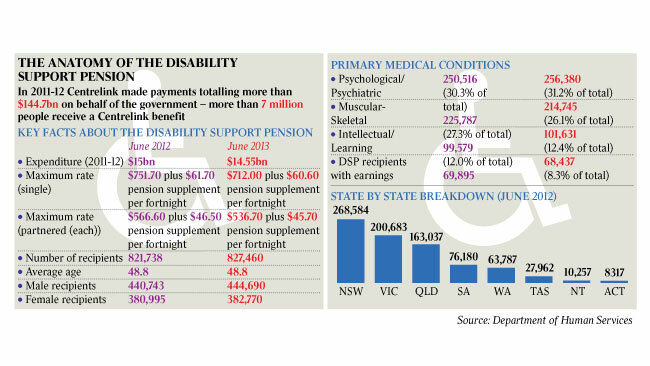 Left unchecked, the number of Australians on disability payments is on track to hit one million in the next decade. Confronted with the staggering $15 billion-a-year cost of the DSP scheme, the Abbott government is preparing major reforms. Social Services Minister Kevin Andrews told The Sunday Telegraph the main option under consideration was introducing a new, two-tiered system that would limit new entrants to temporary payments only if their disability was not permanent. The second option was ensuring that younger workers aged under 40 were subjected to more regular reviews to check if they were capable of working part-time. Mr Andrews said he wanted to focus on ability, not disability. “The best form of welfare is work, if that’s possible,’’ he said. “We’re looking at whether or not there should be a category of what I might call temporary incapacity, rather than permanent incapacity. The DSP payments offer significantly more cash than the $500-a-fortnight unemployment benefit, another incentive for people to convince doctors they are too sick to work. Mr Andrews said that one third of DSP recipients now argued they could not work based on psychological problems, including depression. This was the largest single group of people on the DSP, overtaking people with skeletal problems, including bad backs. “If people have got some sort of psychological condition, is that a condition that necessarily incapacitates them from permanently working? They may be able to work,’’ Mr Andrews said. Mission Australia’s Toby Hall has argued that the majority of people with significant mental health problems could return to work with help. Mr Andrews also conceded he simply did not have the resources to constantly review the 822,000 people currently on DSP benefits. “It costs money to review people and if you’ve got 800,000 people, to be frank, there’s no way we could review all of the 800,000 people,” he said. “If somebody is in their 20s on the DSP I think there is a case to be made out for more regular reviews. Mr Andrews said the ageing population would put new pressures on the system. SOCIAL Services Minister Kevin Andrews says his proposed crackdown on the monolithic Disability Support Pension isn't the result of a quest for savings and noted it would cost the government money in the short term. His mooted changes would see more people younger than 40 checked to see whether they could work and temporary payments for potentially impermanent conditions to prevent the number of those in the system from ballooning to one million. "Nothing is set in concrete yet, but I'm not doing this to chase savings," he told The Australian. "It's a matter of ensuring we have a system of welfare that is sustainable and fair ... I am concerned that a genuine safety net will be compromised if we don't make it sustainable. If there are savings, it will be in the medium to long term. When I last oversaw welfare reforms in 2005 it cost $3 billion." Labor attempted to use the announcement to wedge Mr Andrews on the national disability insurance scheme by calling for a guarantee nothing would be cut from the NDIS, intended to support people with disabilities but not to replace the pension. "The first thing the Abbott government should do to support people with a disability is guarantee there won't be cuts to the NDIS," acting opposition employment spokesman Doug Cameron said. Mr Andrews has appointed former Mission Australia head Patrick McClure to head his review. Mr McClure was deputy chairman of Mr Andrews's 2005-06 Welfare to Work Consultative Forum, which resulted in the first round of reform to single-parent payments. Mr Andrews reiterated remarks made by Joe Hockey and Finance Minister Mathias Cormann earlier this month. "We are committed to the NDIS and part of that commitment means making sure we are able to pay for it and it is sustainable," he told The Australian. "The funding beyond the trial period is not all in place ... and there has been a cost blowout in those trials. Whether that continues into the ... manifestation of the scheme, we don't know. "These are all things the commonwealth and state and territory governments need to work out. I think it would be a cruel hoax on the people we are trying to help if we didn't make sure the NDIS was cost-effective." The minister responsible for delivering the NDIS, Mitch Fifield, said it was unfortunate "Labor keeps scare-mongering on the NDIS and causing needless concern for people with disabilities". The DSP reform proposal was cautiously observed yesterday by interest groups that criticised the announcement, which was divorced from any talk of employment. "I believe 830,000 is too many people with disabilities to be locked out of the labour market," People with Disability president Craig Wallace said. "People with disabilities can work, want to work and do work. "I actually think the story is about jobs. It's about how we remove barriers and create more opportunities." National Welfare Rights Network director Maree O'Halloran said the Coalition government should not "repeat the mistakes of 2006", when Mr Andrews was employment and workplace relations minister. Disability and welfare advocates have questioned the Abbott government's plans to tighten up the disability support pension, arguing the Coalition is pulling the ''wrong levers'' to get more people off the pension and into jobs. 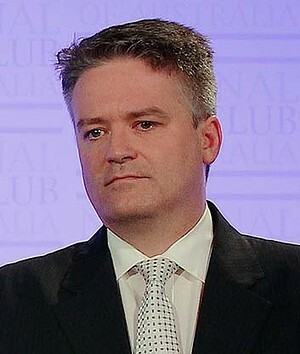 On Sunday, Finance Minister Mathias Cormann confirmed the government is looking to cut DSP costs. The pension provides support to about 822,000 people a year at a cost of $15 billion. ''Right now we're looking right across government for opportunities to improve efficiencies, to reduce costs in a sensible fashion - this is one of the fast-growing areas of government expenditure,'' he told Sky News. Concerned about a 22 per cent rise over the past decade in those paid the DSP, the Coalition wants to more of its recipients moved into the workforce. ''Our view is, anyone who can work, should work,'' Senator Cormann said. It is understood the Coalition is considering more regular reviews of DSP recipients under 40 and of temporary payments to people who do not have permanent disabilities. A spokeswoman for Social Services Minister Kevin Andrews said the government was consulting stakeholders and was keen to ''get a move on this'' in the new year. People with Disability Australia president Craig Wallace, who has not been consulted, agreed it was important to get people with disabilities into paid work but said more sustainable measures, focused on workplace cultures, job creation and personal support, were needed. ''We're pressing the wrong levers on this problem,'' he said. Australian Council of Social Service chief Cassandra Goldie said she was concerned the review was ''more about budget savings'' than support for people with disabilities. FINANCE Minister Mathias Cormann has confirmed the government is reviewing the Disability Support Pension to ensure any person capable of working returns to employment. News Limited Sunday papers have reported the Disability Support Pension scheme is facing a significant overhaul, with the Abbott government contemplating a two-tiered system that would limit new entrants to temporary payments if their disability was not permanent, and subject workers under 40 to more regular reviews to determine whether they are capable or part-time employment. Speaking on Sky News' Australian Agenda this morning, Senator Cormann said the Disability Support Pension was "one of the fast growing areas of government expenditure." It is understood almost one in 20 Australians of working age are on the pension, which provides support of up to $800 a fortnight. "The objective of course, is to ensure that those in genuine need receive the appropriate levels of support, but that people who are able to work are encouraged to go back to work," Senator Cormann said. He also confirmed the Coalition's Commission of Audit was also probing the scheme, which left unchecked, could see one million Australians a year receive the benefit without the requirement to look for work. "These are the sorts of discussions that we are having at the moment and of course the Commission of Audit is looking at this whole area for us as well and is expected to make some recommendations to us on how that can best be achieved by the end of January," he said,"We think there is an opportunity here for a win/win." "Obviously only those people who genuinely need disability service pension support should be getting it, and our view is that anyone who can work should work, and of course the disability service pension arrangements should facilitate that," he said. Labor's parliamentary secretary Ed Husic defended the scheme, saying people often had to jump through hoops to qualify for the benefit. "As a local member I get more complaints about people being able to get onto DSP," he told Australian Agenda. Mr Husic said the government should always looks to ensure that people who had difficulty gaining income through employment because of a disability were protected without being demonised. He criticised the form of the government's announcement. "There is no framework, no consistency, no detail, from (Social Services Minister) Kevin Andrews today," he said. "It is unclear whether or not they will basically be forcing all new people to go through regular tests, or the people who have jumped through hoops to get DSP to be able to retain it."